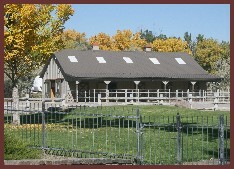 Facilities: We have accommodations for up to 4 horses and one couple. The horses have stalls with runs or paddocks, auto waterers, and hay is available. The people traveling have a "bunk house" in the same barn as the horses, with double bed, fold out twin bed, under floor heat, air conditioning, WiFi, Direct TV/VCR, kitchenette, washer/dryer, shower. Our ride out is spectacular, if you care to trail ride. We also have an arena, roundpen, obstacle course, and exercise track. Location: Our ranch is between Abiquiu and Medanales and within easy access to Route 84, right at mile marker 204. 2913 Gun Club Road, S.W. 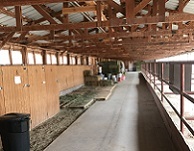 Facilities: Meticulously clean facility containing two barns, one with 11 stalls with 7 total box (10' x 12') and 4 (15' x 10'), all heavily bedded. We also have a side barn containing 4 total box stalls 12' x 15'. We also have several large outdoor stalls (no shavings) which are partially covered. Large arena and round pen for turnout. Newly remodeled non smoking guest house on premises with refrigerated air. Two King beds, two twin beds and one full futon. Cable TV and WIFI. Light breakfast items included. 110 Hookups only. Nearby food choices include McDonalds, What-A-Burger, Sushi Place, a Chinese Place, and also note that there is a Taco Truck directly across the street that has yummy street tacos that stays open until 11:00 p.m. Location: Call or e-mail for directions ....... approximately 10 to 15 minutes from I-40 and I-25. Facilities: Multiple 12' x 24' covered stalls, secure lot, trailer parking, round pen, arena and two paddocks for turnout. Close to hotels, restaurants and shopping. Call to make a reservation. Location: Located 3 miles west of I-25 and 5 miles north of I-40. Take Exit 233, Alameda, west across the river, or take the Coors exit north from I-40. We are one block east of Coors on Alameda. Facilities: 10’ x 40’ partially covered stalls, 30’ x 20’ turnout stalls, round pen, wash rack, hay available, large turning areas for trailers and semis. 2 RV hookups ( 30/50 amp, water & waste-dump) open 24 hours year round. 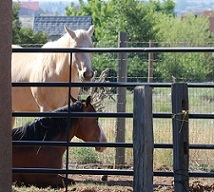 Location: Stables are in a rural area 20 minuets south of the I-40 & I-25 interchange. Many hotels and restaurants 10 minutes away. We are near the Albuquerque International Airport. Facilities: Overnight Stalls available in a beautiful 25 acre Pecan Orchard. Indoor stalls OR very large, approximately 1/4 acre. Safe, cleaned daily, outdoor turnouts with access to covered stall. We can accommodate up to 15 horses. Studs welcome! 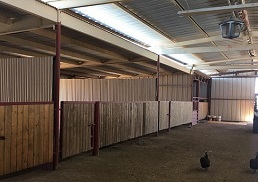 We have 7 bedded 14' x 14 box' stalls are very clean and deeply bedded with shavings in an enclosed barn, 1 20' x 20' covered, bedded box stall, 1 15' x 10' covered box stall with a run, and 6 very large 1/4 acre safe turnouts with covers. Automatic waterers and buckets with fresh water are hung for horses not familiar with auto waterers. Large hay/grain feeder in each stall or turnout. Large round pen or arena is available if excersize is needed. Plenty of room for BIG RIGS. We have a very cozy Bunkhouse just a few steps from the stalls that has a queen bed and 2 twin beds, T.V with satellite, refrigerated air (summer) and heated (winter), bathroomm with shower. Coffee, tea, condiments and snacks provided. Kitchenette with dishes, microwave, etc.. We have lots of room for self contained rigs and RV Hookups (30 amp) with water available. We are just over a mile 4 minutes from the interstate. Easy off and easy on. 2 miles from upscale Western Steakhouse, Denny's or fast f ood. i.e. Mc Donald's, Wendy's, Subway, KFC, Taco bell or Mexican food. 3 Full service, 24 hour truck stops are 2 miles from us as well as a Best western or America's value Inn. Location: Great location Avoid the hectic El Paso traffic; we are just on the outskirts. 5 miles from El Paso City limits. 1 mile from New Mexico/Texas state line. Our stables are located 1.5 miles west from I-10, exit 162. Turn right on 404, easy off and easy on. 2 miles to 3 different truck stops with 24 hour fuel, restaurants or lodging. Facilities: Kiva RV Park & Horse Motel prides itself on offering not only a spacious and lovely campground but also on its horse accommodations. There are stalls with runs, box stalls, and large pens to accommodate a large number of horses at any given time. 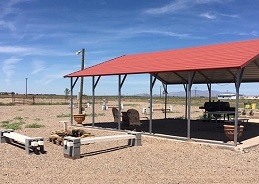 The location of the campground is ideal and offers riding opportunities directly from the property and onto the surrounding area so horse and rider can enjoy a time of exercise while experiencing the beauty of the local western terrain. *** Great place to also stop and allow your horses to get out and stretch their legs and exercise. **** Yes – we can handle large rigs. Total available horse accommodations: 14 stalls with or without runs, 3 pipe corrals (30’ x 60’) with weather shelters, and a 60’ round pen. Facilities: We are a family owned facility that offers top of the line covered stalls with 30 ft runs, 5 of the 10 stalls have individual hay/tack locking tack rooms. Each stall has its own sanitized heated electric water and a tub for each pen if needed. We are easily accessible for any big rigs and have electrical and water hookups.We offer monthly/nightly rates and have hay on site if needed.We also have large outdoor pens. We live on the premises, love people and horses, and look forward to meeting you. Location: We are exactly 1 mile west from the only stop light in town on US 56/Springer Highway. Historical down town Clayton is easily accessible. Facilities: The one and only place for you and your horses to rest. Very quiet location off the beaten path. Large 20' x 20' barn and covered stalls with 20' x 40' paddocks. Large turnouts and 8 acre pastures. Equipped with 2 round pens and a roping arena. RV hook ups close to the barn allow you to be close to your horse. We also have a really nice 5th wheel set up on site. We are offering overnight lodging for $75/night. That includes hot water, shower, electric, heating/cooling, kitchenette with coffee and tea available. Available for short or long term stay. Owners live on property and have 24 hour surveillance for top security. Open 24 hours and also have feed available. Reservations not required but are very much welcomed. All major credit cards accepted. Location: 10 miles east of Hwy. 549 on Josefita Road SE. 1 mile down, first barn on the left. Facilities: We have indoor and outdoor stalls, two arena areas, and a round pen. Easy on and off to and from I-40. Trailer space is available. Two rooms are available. Contact us for more information. Location: We are 30 minutes east of Albuquerque. 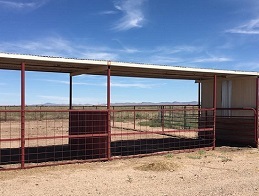 Facilities: Spacious corrals; 30' x 40', 40' x 90', and 25' x 90', a round pen is also available. Dry R.V. camping is permitted. Free WiFi. We're within a mile of I-40 on a quiet, dead end road. If you have a big rig call us to discuss ease of access. Location: 30 miles east of Albuquerque. 1mile east of exit 187 at Edgewood. Call for details. Facilities: Outdoor arena, trails, round pen, 12' x 12' matted stalls with 12' x 36' run out, large turn out, trailer parking. Location: About 5 miles north of Taos, NM. Facilities: Full rv hookups with onsite corral facilities. Location: Seven miles north of Highway 64 and Highway 170 intersection. County Road 1788, turn right just past church with green roof. Facilities: Large stalls with automatic waterers with or without runs, indoor cold/hot wash rack, round pen, Owners live on premises. Trailer parking available, security entry gates, riding arena, beautiful non-smoking guest house sleeps 4 on premises (indoor pets subject to pre-approval), one RV space available with full hookup for $35 per night, self-contained motor homes/campers welcome for $25 per night. Visa & MasterCard are welcome. Please see our website for full description, prices and pictures. Location: From Main Street in Farmington turn south on Largo Street by Animas Valley Mall, approximately 1 mile to end of Largo St. Once you're passed the mall go 6 blocks to the end of Largo Street. Turn left in the cul-de-sac & the middle gate is for the stables. Location: Right off of I-40, exit 79. Turn left at Loves Truck Stop and then left at the stop sign and check in at the RV park. Facilities: Indoor box stalls, outdoor pens, round pen, indoor riding arena, roping arena, bunkhouse. Location: Grants, N.M. Exit 81. Go south on highway 53, mile marker 79, turn right, cross cattle guard on CR 52, proceed about 1/4 mile, We will be the only place on the right. Call if you need assistance. Facilities: We have porta-Stalls bedded, outside open shed-rows, outside pens, wash rack, round pen, horse walker, and trailer hook-up. We also have lodging available on site (sleeps 3) for $50 per night. Location: 3 miles west of Interstate 10 at Exit 155. Directions are on our website. Facilities: Santa Fe's Premier Boarding Facility. 70' x 200' indoor arena, 150' x 300' outdoor arena, 60' round pen, 16' x 72' off of all stalls, 6 large turnouts, 22 stall show barn. Additional box stall and paddock board available at reduced rates. Automatic heated waterers, heated lounge & restroom, washer and dryer on site. Ranch Manager on site. Daily arena grooming. Exceptional staff. A la carte lunch, blanketing, and turnout services available. Stalls $25/night. Limited hook ups available $30/night. Reservations required. Big rigs welcome. Paved road. Location: Santa Fe, New Mexico. 3 miles from I-25, Hwy 285 interchange. 12 miles from downtown. 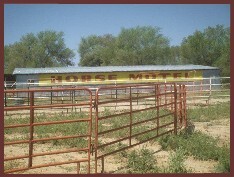 Facilities: Quality clean horse motel - easy access, large parking space and turn around. Securitiy light and safe fencing with perimeter gates. Metal barn has 12' by 12' stalls with rubber mats and shavings each with a 48' run. Outside runs. Large outdoor arena. All are the grey Priefert horse panels. Outside runs or inside and inside/outside rates available. RV electric hookups available. Trailer parking available. Easy access for big rigs. Horse owner provides feed but hay is available for sale. Horses like it here. Motels are within 1 to 3 miles. Location: Exit 452 east off I-25. Go 1/4 mile onto Jackson Lane to entry gate. Facilities: We are what you're looking for in a home away from home atmosphere. Our facility is quiet, clean and comfortable. Nine 12' x 30' semi-covered pens alongside an exercising arena and also a turnout pen for your use. Fresh water available. Pens are cleaned and looked after daily. Horse owner is responsible for their own horse's feed. Two LQ Hookups with electricity and water. Plenty of space to move your rig around. Owners reside on premises with security gate access to the property. Call to make reservations. One week notice or prior arrangements for cancellations much appreciated. Please, visit our website for rates, photos and contact information. Location: 4 miles south of Roswell on US 285, turn west on Hobson Road, go approximately 1 mile and we are the first right turn right off the railroad crossing. For map check our website. 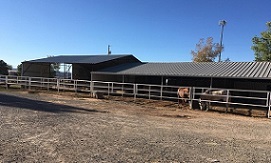 Facilities: 12 - 20' x 20' inside stalls, inside barn . We offer nightly, weekly, or monthly rates. Full care is available on monthly stays. Stalls are cleaned daily. We're 5 minutes off Highway 70, behind the race track . Facilities: Horse boarding stable that offers large stalls with pipe runs, multiple arenas, trail access, free trailer parking, daily stall cleaning, and a fun, safe environment for you and your horse. Reservations Required. Location: Arrowhead Ranch is conveniently located on W. Alamdea Street, 3 miles west of the Santa Fe plaza downtown. Facilities: We offer 32 indoor, 12' x 12' stalls, 14 runs with partial cover, indoor and outdoor arenas, and holding pens. Electrical hookups are available. Location: 40 miles east of Albuquerque, NM and easy access from Interstate 40. On I-40 go 40 miles east of Albuquerque to Exit 196 (Howard Cavasos Blvd,). Go north (left after the exit) on Highway 41. Travel 4.5 miles to Western Road and turn right. We are the first driveway on your right. 2500 E. Route 66 Blvd. Facilities: Self Serve 16' x 16' horse pens. Fresh water for your containers. Must clean up after animals. Location: Exit 335 on Interstate 40 in New Mexico. Turn westbound into town, 3/4 mile on the leftside..
Facilities: Indoor stalls and outdoor paddocks, 2,500 sq ft riding/roping arena. Overnight, long term and layup boarding of horses and other large animals. Free Parking for self contained units. Parking and hook-up for trailers at a nominal fee. Close to motels and restaurants. Location: 1400 East Main Street, Tucumcari, NM. 175 miles east of Albuquerque. Easy access to and from I-40. Exit 333. Facilities: There are 3 options from which to choose: Horse Camp - with 3 rooms and 3 stalls; Dry Camp - 2 stalls and large turnout, no utilities; Line Camp -2 stalls and turnout, no utilities. Location: Horse Camp and Dry Camp are in Vanderwagen, NM which is 21 miles south of Gallup on 602. Line Camp is behind Ramah and the Zuni Mountains.